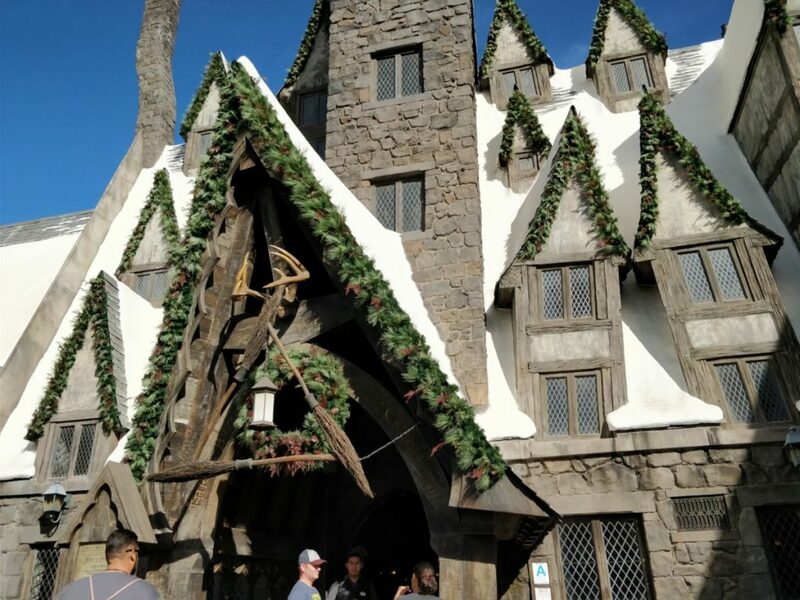 Amidst the magic and wonder that is the Wizarding World of Harry Potter, there is a cozy little restaurant called The Three Broomsticks which is the exact restaurant/inn that Harry and his friends frequent in the series!! 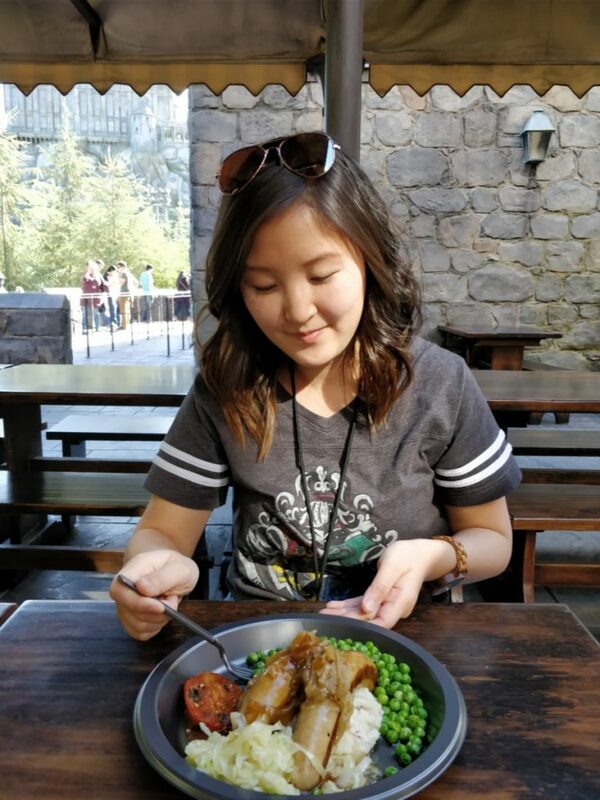 Since I got a bit hungry while wandering the Wizarding World, Meta Knight and I decided to stop by The Three Broomsticks to try out their British pub fare. 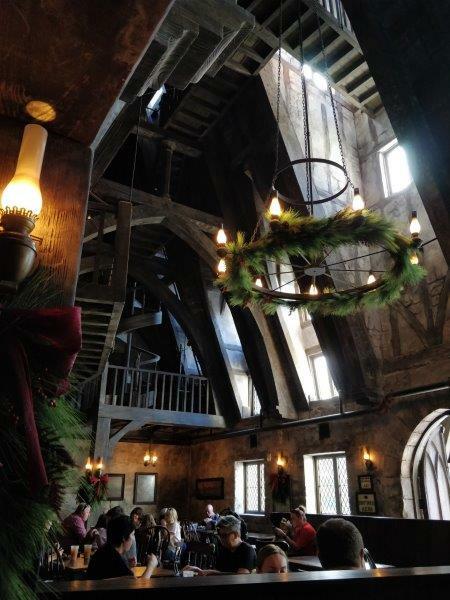 From the incredibly high ceilings to the rustic brick walls, The Three Broomsticks was exactly how I pictured it in my head when reading Harry Potter. 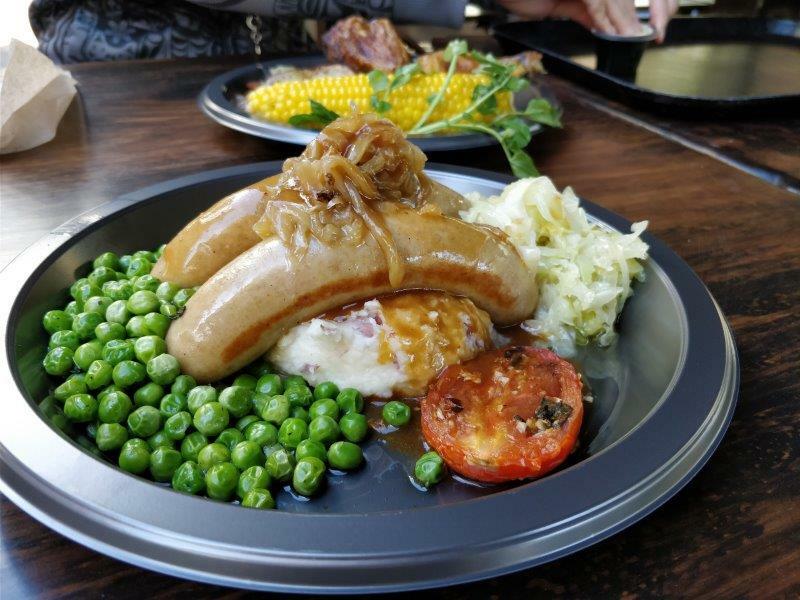 It’s honestly quite amazing that Universal Studios built a restaurant that perfectly replicates one from a movie or book, and that you can have the opportunity to dine in it like a character from the book. 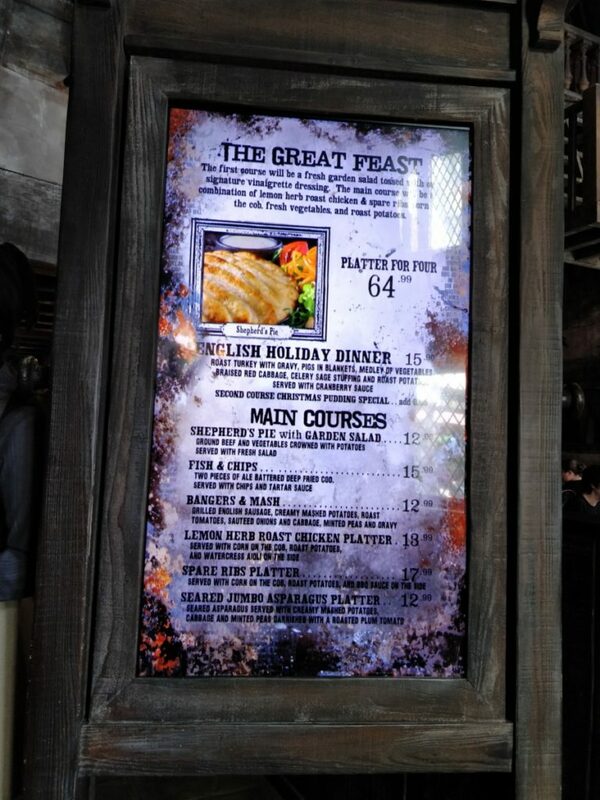 As I mentioned in my other post “Top 5 Things to See at the Wizarding World of Harry Potter“, one of the ways this restaurant is celebrating the holidays is by offering a classic Holiday Dinner ($15 USD) which includes roast turkey, cranberry sauce, pigs in a blanket, a medley of vegetables, braised red cabbage, and roasted potatoes. It’s only until January 7th, 2018 so make sure you check it out before then for your holiday feast! 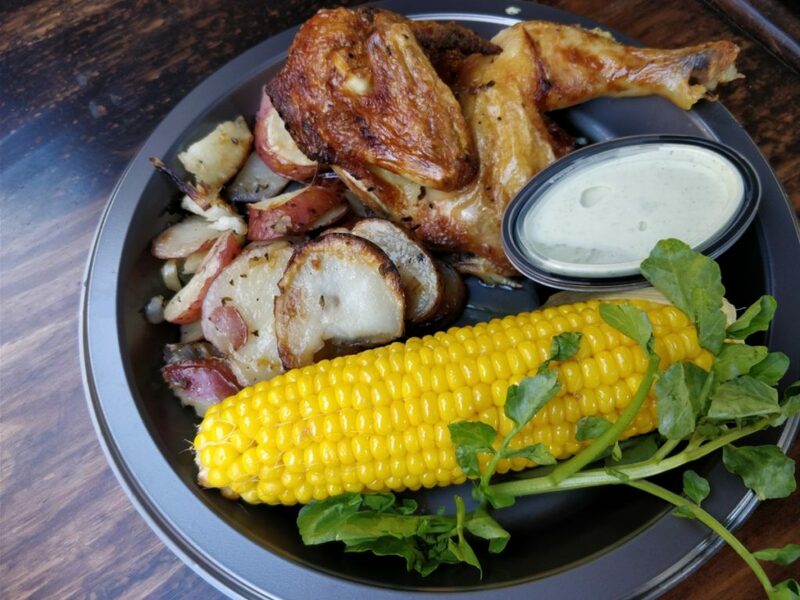 Meta Knight opted for the Lemon Herb Roast Chicken Platter ($13.99 USD) which included lemon herb roasted chicken, (super buttery but delicious) corn on the cob, roasted potatoes, and watercress aioli. Usually with chicken dishes at large festivals or amusement parks, it can get dry pretty easily due to it being cooked in large quantities. However, the chicken was surprisingly moist, flavourful, and went really well with the watercress aioli. 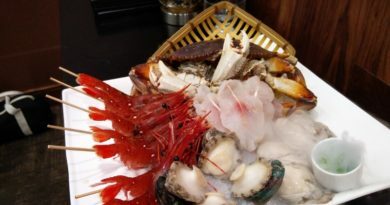 Obviously it wasn’t a perfect dish, but definitely not bad considering the price and the environment. 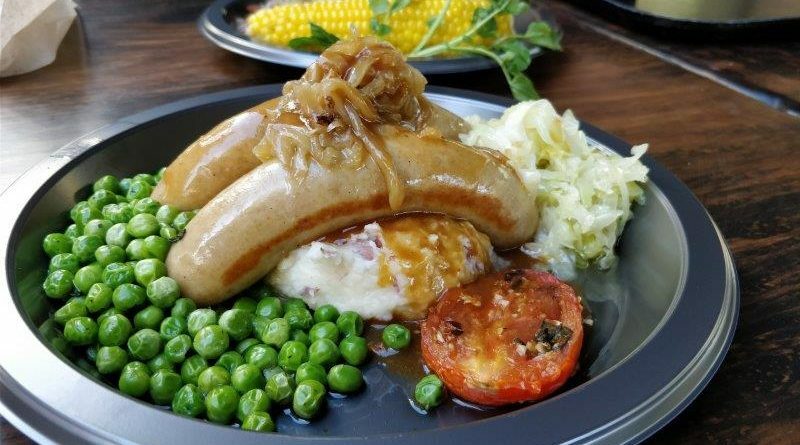 As for myself, I went with the Bangers & Mash ($12.99 USD) which included 2 English sausages, creamy mashed potatoes, minted peas, roast tomato, gravy and sauteed onions and cabbage. For under 13 bucks, this was a really big portion! And also really scrumptious! 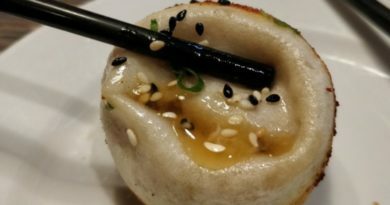 I loved everything about this dish and would gladly order it again in a heartbeat at any restaurant.